Skin Relief & Support is filled with natural plant-based moisturizers that give your skin that healthy, glowing look. Your skin will feel soft and supple when it is hydrated to a healthy level. Skin Relief is safe, gentle and safe for all ages. It gives your skin full strength nutritive support with ingredients that are food-grade plant extracts. So wherever you have skin, Skin Relief works its magic. Absorbing quickly into dry, troubled skin, Skin Relief gives both quick and lasting relief as your skin goes through its renewing processes. This unique blend of plant extracts is designed to moisturize a multitude of various skin conditions, including burns, sunburns, insect bites, scrapes, windburn, etc. Just apply a few drops anywhere on your skin start seeing amazing skin results immediately. Directions: Apply a modest amount anywhere your skin needs support. Safe and soothing, does not burn or sting. While 2-3 times/day is usually enough, you may use it as often as needed. Listen to your skin – it tells you it needs more when it feels itchy or uncomfortable. Keep a bottle with you for fast skin relief. Please see insert for more uses. Ingredients: Prunus Armeniaca (Apricot) Kernel Oil, Sesamum Indicum (Sesame) Seed Oil, Caprylic/Capric Triglyceride, Simmondsia Chinensis (Jojoba) Seed Oil, Aloe Barbadensis (Aloe Vera) Oil, Squalane, Camellia Kissi (Sasanqua) Seed Oil, Persea Gratissima (Avocado) Oil, Olea Europaea (Olive) Fruit Oil, Tocopheryl Acetate (Vit E Acetate), Lecithin, Tocopherol, Cholecalciferol (Vit D3), Tetrahexyldecyl Ascorbate (Vit C Ester), Essential Oils. I am shocked to see there are not hundreds of reviews? I have a skin condition that makes my palms itch so bad I scratch my skin off then they dry out and crack. It becomes so painful I cant stand it. I apply a little (drops) on my hands at bed time and in the morning they are almost healed up! I also use a hair removal product for my peach fuzz face, it says its for sensitive skin BUT it causes me to look like my face got burned for days so I tried some of this oil on my face and bingo burn gone within hours. A 2oz bottle last me at least 2 years. I was worried that I would get on line and Miracell would be out of business then what would I do? 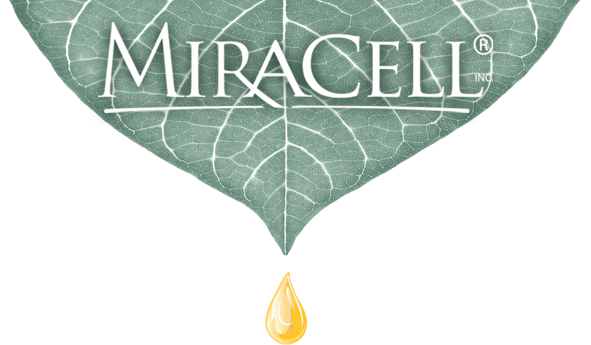 I am excited to see now they offer other products as well I will give them a try at a later date 🙂 Thank you Miracell you are a skin saver!!! 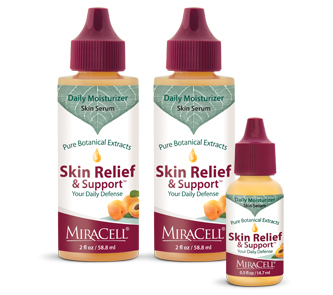 We are SO glad that you have found relief using our Skin Relief and Support product. We love to hear from our customers!!! We do have a lot of great reviews like yours, however certain regulations keep us from being able to use them! We appreciate your kind words and we are happy to be of service!! Thanks for taking the time to reach out to us!! I have very sensitive skin on my face, and in the winter my fingers develop deep painful cracks if exposed to the cold. 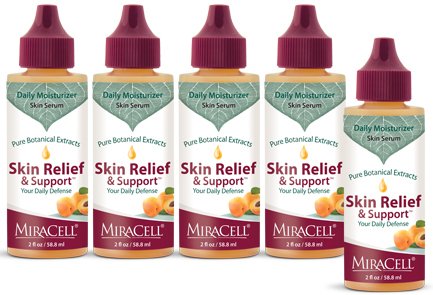 I started using Miracell Skin Relief oil about 5 years ago; I put it on my face, neck and hands before bedtime, and during the dry cold of winter I do the same before going outside. It is the best product I’ve found to keep my skin soft and healthy, it speeds healing of any skin issue, and a tiny amount run through my hair makes my hair glisten. Love this product! Wow wow wow! I was given the small size of this oil a few months ago by a friend when I had severely burned my lips. It was a life saver and helped the burn sensation go away, as well as sped up the healing process. Now I use the bottle on dry spots and when my kids skid their knees. I also use it as moisturizer at night for my neck and eyes! Great product!!! Amazing! My wife had a big chunk of her face twice removed by the dermatologist because of cancerous cells. She applied Miracle oil on her stitches and healing wound. She has little or no evidence that shows she had such a significant part of her face was removed. Now I just had a bit of surgery and I am using it on my scars. Still healing but after applying the oil my wounds feels so much better and are not so aggravated . 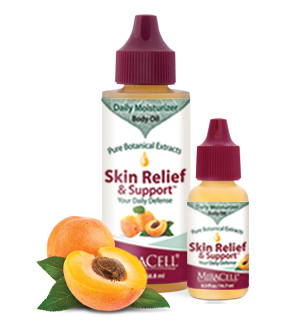 I love this oil and am convinced that it truly is a miracle product for treating the skin and wounds.